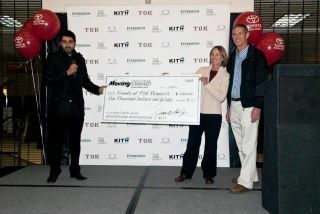 After tough voting in a facebook contest, our charity Friends of FSH Research won $5,000 from the Toyota of Kirkland dealership. Thanks to all the voters that took the time to “like” our charity, we were the top vote getters and the winners of this grant from Toyota. Our charity auction’s theme this year is “With a Little Help from Our Friends.” Though it might be a song with some questionable references, for us it is a song that celebrates friends. It has taken the support of many friends to push our mission forward toward finding a treatment or cure for FSH Muscular Dystrophy. And now, our circle of friends just got bigger – thank you Toyota of Kirkland for being a friend!